How do mycoplasmas enter my cell cultures? | Bionique® Testing Laboratories, Inc. The first step in avoiding mycoplasma contamination is to understand the most common sources of infection coupled with a program designed to reduce the risk of exposure to these sources. To view our mycoplasma testing services for cell cultures click here. The main source of mycoplasma infection, in the majority of cases, is cross contamination by a previously mycoplasma-infected cell culture which is used in the same laboratory. McGarrity (1976) clearly demonstrated the efficiency and rapidity by which mycoplasma infection could spread in a cell culture laboratory. He intentionally infected a single culture with mycoplasma and then closely monitored the transmission of the mycoplasma within the laboratory. It only took six weeks before another cell culture in the laboratory became mycoplasma positive with the same species. In this study, mycoplasma was recovered from laboratory equipment (hemacytometer and disposal trays), technician's hands and work surfaces. Mycoplasmas were surprising hardy despite their lack of a cell well. They survived on surfaces, even in operating laminar flow hoods, for as long as six days. The problem of cross contamination often begins when a researcher obtains a new cell line from an outside source and then fails to quarantine and test the culture immediately prior to introducing it within the laboratory. The cell line may appear normal and healthy butthere is a likelihood that it is contaminated (View Mycoplasma contamination rates Table 1b). This mycoplasma contaminated cell line then becomes a fertile source of infection that will likely spread to other cultures in your laboratory (Figure 5a). Figure 5a - A single mycoplasma contaminated culture can quickly infect other cultures in the laboratory.Therefore, in the vast majority of times, mycoplasma contaminated cultures originating from the same laboratory are usually infected with the same species. Every time a mycoplasma positive culture is handled in the laboratory aerosols and particulates are generated creating an opportunity for the infection to spread. If stringent aseptic culture techniques are not maintained then equipment, work surfaces, media and reagents may become contaminated leading to further spread of mycoplasma contamination. It is crucial to adhere to the practices of working with only one cell culture at time and designating separate media and reagents for each individual cell line to prevent cross contamination. The good news is that by simply testing all new cell cultures and following strict cell culture procedures,youcan minimize the risk of mycoplasma infection from this primary source of contamination. The laboratory technician can also be a major source of mycoplasma contamination (Figure 5b). Figure 5b - Image by Bill Branson, courtesy of the National Cancer Institute@ Any laboratory personnel can be a mycoplasma carrier and potential source of contamination.Human mycoplasmas continue to be the primary species isolated from contaminated cell cultures. M. orale, a species commonly found colonizing the human oral cavity and oropharynx, has been the leading contaminant in study after study (Table 5a). Two other human mycoplasma species, M. fermentans and M. salivarium, are also detected in contaminated cultures but at a much lower rate. A study by McGarrity (1976) investigated the role of the laboratory worker as a possible source of mycoplasma contamination in cell culture. He showed that the majority of technicians tested were carriers of mycoplasma, primarily M. salivarium. Throat swabs, which were used to inoculate broth and agar cultures, recovered mycoplasma from 25 of 31 (80.6%) laboratory technicians tested. Finally, he evaluated modes of mycoplasma transmission by collecting aerosols generated via talking and sneezing from known mycoplasmal carriers, on culture plates. In these instances, M. salivarium was isolated from 1 out of 16 plates (6.2%) cultured from talking and 3 out of 8 (37.5%) plates cultured from sneezing. It is very important to understand the role that antibiotics play in allowing successful human to culture transmission of mycoplasma. (The link between antibiotic usage and mycoplasma contamination problems is discussed greater detail in the previous section.) A successful transmission is defined as the introduction and cultivation of mycoplasma within a cell culture which has occurred without recognition or diagnosis. Particles or aerosols generated from laboratory personnel that contain mycoplasmas are virtually guaranteed to contain many other microorganisms, mostly bacteria but also fungi (Table 5b). Without antibiotics in the culture medium, some of the microorganisms from the particles or droplets would grow and visually be detected within a few days. The culture is then almost always discarded along with any mycoplasma it may have contained. When antibiotics are present, there is a chance they will inhibit the establishment of the other microorganisms but not the mycoplasmas because of their inherent resistance. 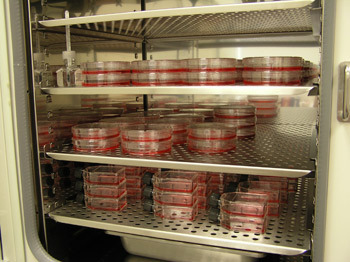 The cell culture with the surviving mycoplasmas will appear healthy even though it has been successfully infected. The culture is now on the way to posing a major problem in the laboratory unless quickly detected by mycoplasma testing. Thus, by aseptic practice instead of routine use of antibiotics in your cultures, this major opportunity for mycoplasma contamination can be effectively addressed. However, there are important applications for antibiotics in cell culture and when used properly, will not increase the chances for mycoplasma contamination. Read our FAQ's abour overuse of antibiotics and avoiding mycoplasma contamination for recommended practices for the strategic use of antibiotics in cell cultures. From media, sera or reagents contaminated with mycoplasma. Because of their extremely small size and flexibility related to their lack of a cell wall, mycoplasma can sometimes penetrate the membrane filters used to "sterilize" cell culture media, sera and other reagents. Consequently, these products provide the third major route for mycoplasma contamination. In the 1960s and 1970s, sera products were a very important primary source of infection, with contamination rates of 18% to 40% reported (Barile, 1973). At that time, 0.2 µm pore membrane filters were used for sterile filtration of final manufactured sera lots. By the 1980s, commercial sera and media suppliers began using serial filtration through at least three or more 0.1 µm pore membrane filters coupled with much improved mycoplasma testing methods to ensure the sterility of their products. Today, sera and media obtained from reputable manufacturers are rarely the source of mycoplasma contamination (Lincoln and Lundin, 1990; Armstrong et al., 2009). However, it is still the responsibility of the end user to verify that the products they purchase have been adequately filtered, tested and certified as mycoplasma-free (Coecke et al., 2005). In the industrial sector, vendor qualification programs which strictly evaluate and monitor these areas should be in place. Most suppliers are more than willing to discuss the procedures they use to guarantee their products' sterility and reliability. It is also important to consider the risks associated with solutions filtered in the laboratory. A common practice in most cell culture laboratories is to use single 0.2 µm pore membrane filters to filter "sterilize" media and other solutions. This practice is relatively safe for filtering solutions and media made from chemical reagents or powders that would be expected to have relatively low mycoplasma levels. However, it is not recommended for filtering raw animal-derived sera and products, or other fluids, such as fermentation broths and even "conditioned" medium in which cells have been cultivated. In these situations, the mycoplasma bioburden could potentially be high. The mechanism used to drive filtration also plays a role. Vacuum filtration with its relatively low pressure differential (typically 5 to 10 psi) is less likely to force mycoplasma through a membrane than if using a positive pressure filter system at 20 psi or higher. When in doubt consider filtering using a smaller 0.1 µm pore membrane filter (Roche and Levy, 1992). When warranted, testing the final filtered product for mycoplasma and other microorganisms will provide the highest degree of reliability and assurance. More information on testing cell cultures and products for mycoplasma elimination can be found in our FAQ's. Recommendations for sterilizing liquids by filtration forindustry applications are beyond the scope of this article. Please note: currently, there are no industry or regulatory standards available for the validation of 0.1 µm filters to standardize or qualify their performance. Consequently, it is difficult for the end users to compare the mycoplasma retentivity of filters from different manufacturers. In response to this issue, the PDA (Parenteral Drug Association) has organized a subcommittee within their Mycoplasma Task Force to develop validation procedures and standards for filter rating with regards to mycoplasma retention. In recent years, there has been a trend in the biopharmaceutical industry to remove raw materials of animal origin from the media in cell culture processes used for the production of biopharmaceuticals. The use of alternative sources for these materials has been incorporated within manufacturing to minimize the risk of bovine spongiforme encephalopathy (BSE) contamination of these therapeutics. However, a surprise has emerged with the increased use of plant-derived materials, the challenge of mycoplasma contamination associated with serum-free media and supplements. This illustrates the need for continued preventative measures and vigilance in qualifying raw materials of either animal or plant origin. A comprehensive review of the association of mycoplasma contamination and plant derived raw materials has been published by the PDA (Proceedings From the PDA Workshop on Mycoplasma Contamination by Plant Peptones, 2007). The next section discusses the development of key strategies to reduce the risk of mycoplasma contamination and other serious cell culture problems. References: (1) Barile et al., 1973; (2) Del Giudice and Gardella, 1984; (3) McGarrity et al., 1979; (4) Bolske, 1988; (5) Drexler and Uphoff, 2002.